Holding animals in captivity in such places as zoos, aquariums and amusement parks has long been touted by proponents as a beneficial educational activity. Rex Ettlin, education program coordinator at the Oregon Zoo, wrote that teachers “should definitely include them in their toolbox” in “Clearing,” the online journal of community-based environmental education. But not everyone agrees with his assessment. Keeping captive animals, wild or domestic, presents dangers for both the captive animals and the public. In 2007 a tiger left a 17-year-old boy dead and two people severely injured after the tiger scaled a wall and jumped a moat. Lion trainer Dave Salmoni was attacked in Toronto in 1999; the lion he was training in front of school children tore some muscles from his arm. Samloni said that he believed the lion loved him. Many people remember Las Vegas entertainment icons Siegfried and Roy, the team who trained tigers. Roy was mauled on stage by a tiger he raised. A whale attacked his Sea World trainer by driving the trainer underwater in 2006. The Oceanic Preservation Society says dozens of people have been killed or nearly killed by captive marine animals over the past 40 years. Such incidents anecdotally demonstrate the very real possibility of attack as a result of keeping wild animals in captivity. Adam Roberts, senior vice president of Born Free USA, said on “Good Morning America” that it’s not good for animals to be put in unnatural settings. Wild animals can become aggressive and attack without warning. Mark Beckoff, a former professor of ecology at the University of Colorado, said on “20/20” that captive animals work nonstop to escape their “prisons.” A former SeaWorld trainer, Jeff Ventre, points out in in “Wired” magazine that not one person has been killed by an orca in the wild. Ventre believes known attacks are precipitated from the stress of being held captive. “It just doesn’t work” to keep large-brain animals or large animals captive, Mark Berman, associate director at California’s Earth Island Institute, a nonprofit organization that promotes ecological sustainability, told CBS News. The animals can become bored and dangerous. The Humane Society of the United States does not believe orca whales should be kept in captivity. The practice of fencing-in highly intelligent animals is cruel, according to the HSUS. Whales, for example, swim 100 miles a day in the ocean, which they cannot do captive. Orcas don’t adapt well to being in captivity. They have a higher mortality rate than their free counterparts, according to the HSUS. They are subject to infection and stress. Ventre says the orcas in captivity get diseased mouths after breaking their teeth on steel bars that serve to separate whales. The needs of elephants are not being met in captivity, either, according to Scott Blais on "20/20." Blais cares for elephants who have become too aggressive for zoos and circuses. Animals in captivity become bored and don’t live in a natural manner, according to ecologist Beckoff. 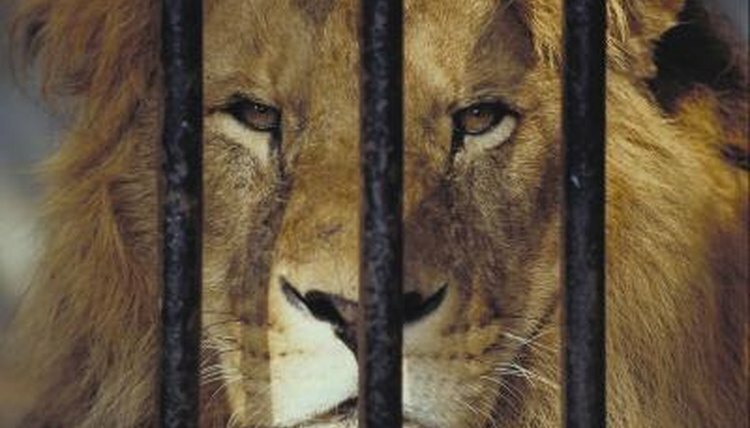 The Centers for Disease Control and Prevention warns that wild animals kept in captivity can spread diseases to humans. Reptiles can spread salmonella, a bacterial disease. Monkeys can spread all sorts of diseases, such as yellow fever, tuberculosis, the herpes B virus and other unidentified diseases. Wildlife such as raccoons, foxes and skunks can carry rabies without showing any symptoms. Even the cute bunny you might find in your backyard might not be safe, according to the Mother Nature Network website. Bunnies can carry tularemia, an illness that can cause fever, muscle aches and progressive weakness. A host of other zoonotic diseases arise from close contact with any number of wild or domesticated captive animal, and those that aren't captive, too. Good Morning America: Should Animals Be Held in Captivity?